The Korean invasion from Kia has been very much under the radar. They came to the UK selling quite boring looking, cheap cars with a great warranty. A break through was in 2006 when they launched the Cee’d; this car was a real wake up call for European manufacturers. It matched its competitors for quality and it beat them all on price and it also has a class leading 7 year warranty, it’s no wonder the car sold like hot cakes. I think the other thing the PR department at Kia did well with was getting the car on Top Gear. The car was the reasonably priced car and while the car was thrashed round the track, if my memory serves me correct, it never broke down even when it was driven terribly by its famous drivers. The next breakthrough model was the new Sportage, this car has a very striking design and thankfully it drives as well as its rivals. The previous model was a very uninspiring looking car, when both cars are parked next to each other I’m amazed they managed to sell any of the old ones. The man behind the stunning new Sportage was Peter Schreyer, an ex-Audi’ designer who designed the original TT; he worked his magic on the Sportage. This car has helped Kia become a big player and they’ve had record sales year on year. The latest car to compete with the Germans is the new Stinger; this 4-door coupe is firmly aimed at the A5 sport back and the 4 series grand coupe. Kia has been out poaching another German specialist but this time they’ve poached BMW’s M division chassis expert, Albert Biermann. Thanks to his knowledge the car is very dynamic and it’s certainly a match for its rivals. You can choose from three trims, the base is the GT line, GT Line S or the range topping GT S. The engine choices are either a 2lt petrol engine or the 2.2lt Diesel which is an extra £2,000. I was lucky enough to drive the GT S which is fitted with a 3.3lt twin turbo V6 which is a lovely engine. Priced at £40,495 it’s certainly not a cheap and cheerful car now. The engine is linked to an 8-speed auto gearbox and the cars are rear wheel drive like some of its rivals. 60mph is reached in 4.7 seconds and its top speed is 168mph. The claimed economy figure of 30mpg is easily achievable especially if you don’t have a heavy right foot; the Stinger has the accolade of being the fastest Kia ever. Peter Schreyer has excelled himself again with the design of the Stinger; it’s such a beautiful looking car indeed. From any angle the car just looks stunning; the GT S with its bigger alloys and body kit looks sporty even standing still. The Stinger is actually wider, longer, taller and heavier than the 4 series. Its boot is also smaller than its rivals; it has folding rear seats which help if you need to load large or bulky items. The Koreans have the styling sorted and the chassis is now class leading, but they really need to poach a car interior designer; the Stingers interior is no match at for its German competitors. I think they could learn a thing or two from the latest Golf’s interior, despite being half the price its interior is very classy and the electric dash just adds to the cars premium feel. One area where the Kia trumps its rivals is with standard equipment, heads up display, heated and cooling seats, heated steering wheel, smart phone connectivity, blind spot mirrors, fully electric seats, autonomous braking, Harmon Kardon speakers and Apple car play are all standard on the GT S. Even the base models have excellent levels of equipment. The Stingers rivals all cost nearly £8,000 more and that’s without factoring in all of the expensive extras that are standard on the Stinger but expensive options in its competitors. The car has four drive modes ranging from Eco to Sport Plus, each mode ramps up the throttle response and gearbox response along with the firmness of the dampers and the weight of the steering. The car is quite happy to cruise along at motorway speeds all day long and the Bembo brakes are amazing along twisty country roads. Despite the cars weight penalty it was great fun to drive. It’s fast, fun and beautifully composed. 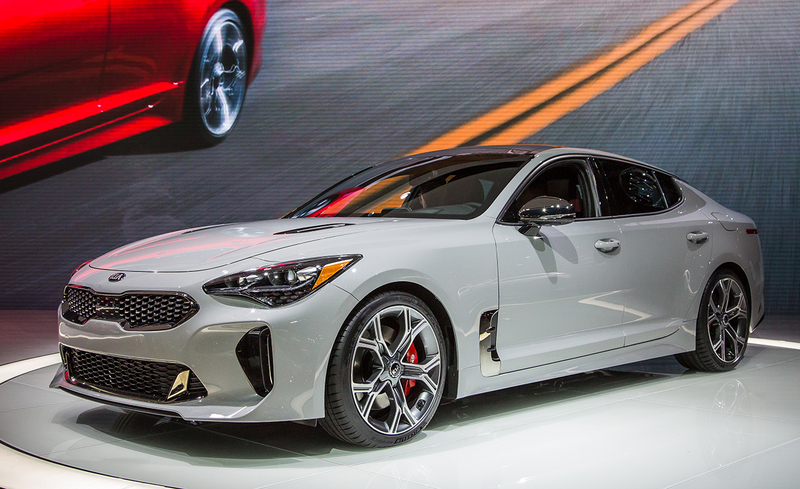 As a first attempt at making a big coupe type car Kia have succeeded in making not only a beautiful looking car but it’s really a nice car to drive. The car is well built and has stacks of toys and gadgets, I’m sure it’ll have the desired effect of showing its rivals that Kia really does mean business and they are no longer just a company who build cheap and cheerful cars with a class leading warranty.